This is another installment in our continuing series on innovations in home design and improvement. Innovation by definition is the process of transforming what we do every day. Changing what is expected. CertainTeed metal roofing feeds right into that by challenging the preconceived notions around metal roofing design. Instead of accepting it as industrial and utilitarian, they reimagined it as something beautiful. CertainTeed Metal Roofing gives you the appearance of traditional materials without the restrictive cost, weight, and maintenance. 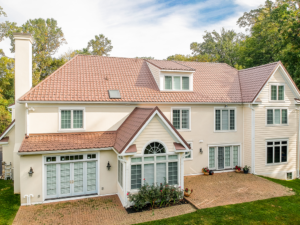 CertainTeed metal roofing has not only innovated in terms of looks and presentation, they have taken the best of traditional roofing practices (like the great warranties) and combined them with new innovations in the market (cool roof technology). Education and training available for individuals and companies interested in getting credentialed in installing metal roofing. “Any one that sees our roof, they first they are amazed that, that’s metal and number two — they are like wow, that’s really, really attractive,” says Fox describes. For over 100 years, CertainTeed has helped shape the building products industry through the development of innovative and sustainable building products and that tradition continues today. Ready to discuss your options with a CertainTeed credentialed contractor? We can help. Plus, more stories of innovation. It may seem like it does, but it really does not! You may be surprised, but metal roof will actually costs less than the asphalt shingle roof if you stay in your house long enough. Not only will it increase the value of your house, but it will also help you save money on cooling costs. Metal roofing can result in up to 50% savings in energy costs during summer months. And finally, metal roof may well be the last roof you will ever have to install on your house. Ever! Provided you get a quality installation from a qualified metal roofing contractor.